This system was created to measure the retroreflectivity of the stripes on the road to ensure compliance with safety regulations. 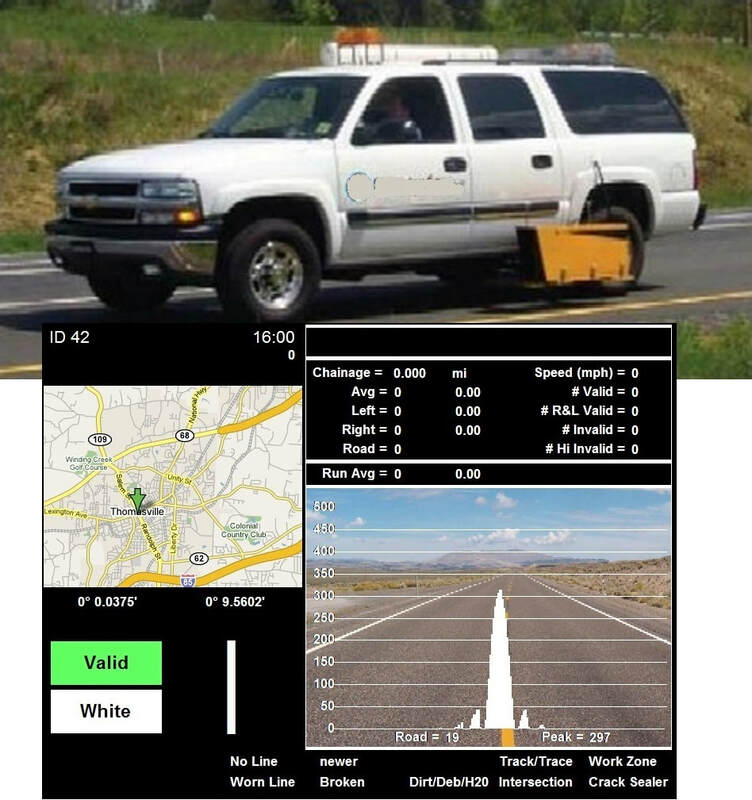 A laser scans the road and takes high speed measurements at normal vehicle speed. Video is recorded with an overlay of the scanned data and map location of the scan location. Upon returning the data is uploaded into a database. All the collected data can be viewed overlayed on maps through an online interface, which enables municipalities to maintain compliance and plan repairs. The system uses three interconnected computers that work together to collect and process the data and video in real time. The customer needed a system to control a complicated process using a cyclotron to create compounds used in PET scanning. We created a system consisting of an NI Compact RIO Real-time embedded controller and multiple thin-client touch screen PC’s with interlocks for monitoring and control from a safe location. Developed in LabVIEW using the S5 Solutions ALOHA framework. The customer had us design an electronic system to template countertops for replacement with granite. We developed an embedded controller that tracks high-resolution encoders to accurately measure the kitchen. The controller connects via Bluetooth to a mobile app that captures the template data and sends it to the factory for cutting. ALOHA is a LabVIEW framework that is extensible. The modular design lends itself very well to team development. Programmers create simple modules that plug into the framework to add functionality, similar to apps on your phone. We have released ALOHA free and open source. We design interfaces that are easy to use and look great. ​But even more important is a design that makes the software easy to use and intuitive to understand. This system controls a complex process for manufacturing a gallium nitride (GaN) and aluminum nitride (AlN) substrates. The manufacturing process is delicate, involving many steps, precise timing, and accurate control of base materials. Safety is of concern, since the process involves the use of poisonous gases. The software is a flexible system created with LabVIEW. It integrates a large number of transducers and controls using DeviceNet. A scripting system gives the scientists the ability to tweak their process without updating the program. This system monitors a manufacturing process in real time. In this case, it does not control the system, but watches many process variables to ensure that they remain in tolerance. The data points are monitored via Ethernet-based DAQ devices, to it can easily spread throughout the factory floor and expand as more data points are identified for tracking. Multiple front-end apps are used to get views into the data of interest. We built a series of testers to provide functional test for a large-scale commercial product. We designed and built the entire system turnkey, including deployment and support at the contract manufacturer site. The boards are quite complex, involving many different interfaces, including wireless Ethernet, IrDA, and MIPI video. We built a new software system on top of an existing legacy platform to hold down cost while increasing test coverage and speed. 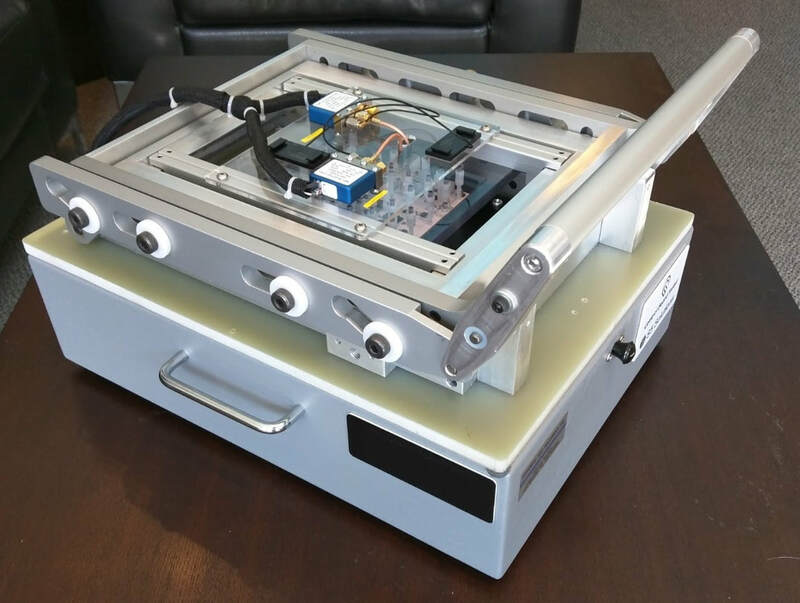 This test system automated the testing of a throttle quadrant assembly (TQA). As a manual process, it took as long as eight hours to complete, depending on operator experience. The tester supports several different types of throttles. Each requires separate test procedures and connection hardware. The software and hardware is modular to allow support throttles for Boeing, Gulfstream, and Canadair. Test time was reduced to under 30 minutes. We have a number of base tester designs that we can use to get a quick start on your tester. They are modular and easily configurable for a wide variety of UUTs. Find out more details to see if this might be the right option to save time and money on your project. This system was designed to allow the customer to evaluate a new technique of using an adhesive to assist in attaching tendon to bone. Operating under repeated stress of motion, the customer wished to capture the strength of the connection, looking for the failure point of the adhesive. Accurate measurements are made in real time to watch the movement of the tendon during each motion sweep. An image is saved at the apex of each movement stroke and assembled together into a movie that shows the adhesive performance at the cyclic peak stress points. This provided a unique insight that cannot be observed visually in real time. This system was created as a research tool for the customer to analyze the performance of a product to enhance vascular surgical technique. The system automates the process of monitoring a set of sample vessels. The system is capable of simulating a variety of physiological conditions to provide stresses on the samples. Unlike a human observer, the system is able to watch the entire process for days at a time and observe the very precise time and conditions of failure. Some our most enjoyable projects have been some of the most unique. This project involved custom hardware and software to interface real airplane controls to a group of 8 computers running Microsoft Flight Simulator. The simulator allows the customer, an aircraft part manufacturer, to test prototypes and demonstrate them for customers in a very realistic but safe environment. In the spring of 2016, a video went viral of a family playing a game with dental mouth openers. It was so funny I wanted one immediately. But after searching online, the game didn’t exist. It had to be made! With the assistance of LabVIEW, we were able to quickly create a game and bring it to market, beating big competitors by months. Not only one of our most fun projects, it was also very profitable. We sold many thousands of games. It was our second largest projects of 2016! This project involved overhauling the software for several kiosks in a health exhibition wing at a science museum. The systems were old DOS systems that were constantly breaking and had old, outdated interfaces badly in need of updating. We gave them all a facelift with new LabVIEW GUIs and replace aging hardware with new computers and DAQ to increase reliability. We also developed a method of storing complex movements as part of the audio, so there is no computer, which reduces maintenance problems.